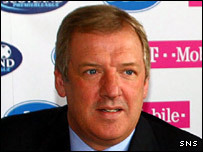 Rangers chairman David Murray says the consequences for the club of fans continuing to sing sectarian songs will be grave. The Ibrox club were fined by Uefa last season for "discriminatory chanting" and have been warned that any repeat will be more seriously punished. "The supporters need to show a certain level of integrity and behaviour in the grounds," Murray told Rangers TV. "But, if they don't, be prepared for the consequences." Uefa has asked Rangers to announce the banning of such songs before every home game, one of a number of steps Murray has taken to attempt to eradicate the problem. "We are creating initiatives for match days, we've been meeting supporters' groups, we've been meeting editors of newspapers, we have been pleading with the fans to show respect," Murray added. "There is only so much the club can do. We can only reiterate it before every match. "But, if we have a small group of fans who want to continue to behave in such a manner, they're doing no service to this club whatsoever and I am sorry to say it, but in the modern world we live in, that behaviour is totally unacceptable. "You can only receive so many warnings and we will receive a stiffer penalty (if this goes on) of which every decent ordinary Rangers fan will suffer, so I just ask those people who wish to continue to sing such songs to please stop. "You are jeopardising the future of our club."